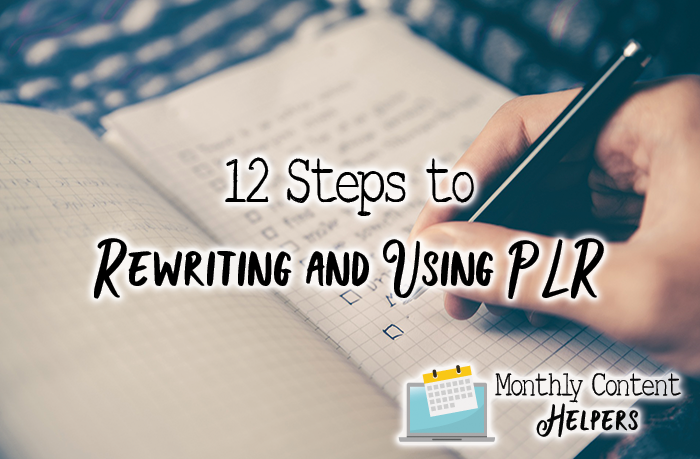 Everyone has their own method for rewriting and using PLR. This is ours and it works for us. First, we don’t always use a blog post as a blog post, and secondly, whatever we use it as, it is rewritten to be unique for whatever it’s being used for. Private label rights are great tools, but as with any powerful tool, it takes time and practice to learn how to use it properly. Don’t fall into the oh-so-common trap of using PLR on your blog and in your work without making some changes to it to make it even better. However, understand that you can use it as is too for many purposes, but these tips help you make it your own. REWRITE TITLES & SUBTITLES – Rewrite titles first to be more in line with your audience. 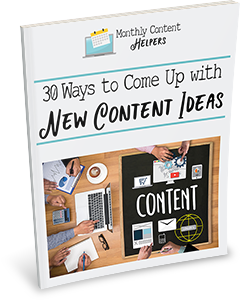 CHANGE THE CONTENT FORMAT – If it’s a list, change it to paragraphs and vice versa. CHANGE THE CONTENT TYPE – If it’s a blog post in text, you can make a podcast. If it’s informational, or video, especially if it’s a how to do something you can turn it into another type easily. EDIT THE INTRODUCTION & CONCLUSION – Put in your two cents at the beginning and end of every post, article, eBook or whatever you’re rewriting. CHANGE LONG SENTENCES TO SHORT & VICE VERSA – Changing the sentence structure is one of the simplest methods of making content more unique and readable. CHANGE THE ORDER OF THE ARTICLE – If the chronology isn’t important, change it. ADD REAL-LIFE EXAMPLES, CASE STUDIES — If you have examples from your own life or the life of a client (with permission to share) then add in these real-world items to flesh out the content. EXPAND ON THE ASSERTIONS – Most PLR is very general in nature, so it will help to expand on thoughts with your own adding facts and figures or simply your own spin. SUGGEST A PRODUCT OR SERVICE – No content is complete without mentioning a product or service that you offer. Remember the CTA. Always. BRING IN YOUR KEYWORDS – You’ve likely studied your audience and know the words they will use to find you, add them where appropriate, but remember not to overstuff your content with keywords. Focus on readability for your customers. CHECK IT – Run the changes through a plagiarism checker to be sure that it shows up at least 80 percent original if you are not publishing directly to the web, 100 percent if it’s going on the web. NOTE: If you’ve quoted someone, and mentioned where the quote came from, it will show up as plagiarism on the checkers but it’s not. It’s okay when you have mentioned the source. We also double check that with Copyscape.com or Plagtracker.com to ensure it’s unique. Just get out your thesaurus and you’ll be shocked at how fast you can rewrite a page of PLR. It takes less than 10 to 15 minutes to go through 500 words. You can find a list of PLR sites that we trust by clicking here. As we discover more good sources we always add them to the list. If you know of any, please feel free to submit them to us via our contact form.